^ Bob Dylan’s Jewish Odyssey. Aish.com. March 12, 2016 [May 20, 2018]. ^ Down the Highway - The Life of Bob Dylan. The New York Times. [May 20, 2018]. ^ Bob Dylan wins Nobel literature prize. The Jewish Chronicle. October 13, 2016 [May 20, 2018]. Dylan was born Robert Allen Zimmerman to Jewish parents in Hibbing, Minnesota in 1941. ^ Walsh, John. 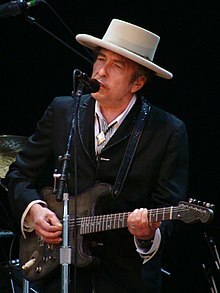 The Big Question: Why does Bob Dylan keep touring and is he still the. The Independent. April 23, 2009 [June 5, 2018]. ^ Dreier, Peter. The Political Bob Dylan. Huffington Post. May 25, 2016 [May 20, 2018]. 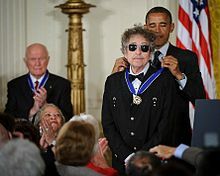 ^ Bob Dylan: 'Prophet' and Medal of Freedom recipient. Jewish Journal. May 21, 2012 [May 20, 2018]. Born Robert Allen Zimmerman to Jewish parents and raised in Hibbing, Minn.
^ How Bob Dylan embraced Jesus in a born-again period lasting 3 years. The Independent. November 1, 2017 [May 20, 2018]. ^ Green, David B. This Day in Jewish History 1954: Shabtai Zissel Is Bar Mitzvahed, and Turns Out to Be Bob Dylan. Haaretz. May 21, 2015 [May 20, 2018]. ^ Frankel, Glenn. DYLAN'S DOLDRUMS. Washington Post. September 9, 1987 [June 5, 2018]. ^ Bob Dylan’s life and work examined in new exhibit. JTA - Jewish news. April 13, 2016 [May 20, 2018]. ^ John Bucklen Tape 的簡介. Skipping Reels of Rhyme. ^ 1963-08-28 該場公開演出的曲目. A Ballad of a Thin Man. （原始内容存档于2009-10-26）. ^ Bjorner's Still On The Road: Mashantucket, Connecticut, 27 November 2010. bjorner.com. November 29, 2010 [December 7, 2010]. ^ Dylan awarded Polar Music Prize. mtv.com. 2000-12-01 [2016-10-03]. ^ President Obama Names Presidential Medal of Freedom Recipients. whitehouse.gov. 2012-04-26 [2012-04-27]. ^ Sisario, Ben. At Grammys Event, Bob Dylan Speech Steals the Show. The New York Times (ArtsBeat Blog). 2015-02-07 [2015-02-08]. ^ Gibsone, Harriet. Bob Dylan awarded French Legion of Honour. theguardian.com. 2013-11-14 [2016-10-03]. ^ Claire Armitstead, Richard Lea, Alison Flood. Bob Dylan wins Nobel prize in literature 2016. The Guardian. October 13, 2016 [October 13, 2016]. ^ The Nobel Prize in Literature 2016 (PDF). Nobelprize.org. October 13, 2016 [October 13, 2016]. ^ Bob Dylan wins Nobel Literature Prize. BBC News. 13 October 2016 [13 October 2016]. ^ Nobel panel gives up knockin’ on Dylan’s door. theguardian. 2016-10-17 [2016-10-17]. ^ Bob Dylan: Nobel Literature Prize left me speechless. BBC. 2016-10-17 [2016-10-17]. ^ Gray (2006), pp. 198–200. ^ Himmelman turned down an invitation to perform on The Tonight Show（英语：The Tonight Show） when it became apparent that the performance would fall on the Jewish holiday Sukkot. Peter Himmelman Puts Family Before Rock 'n' Roll. npr.org. October 12, 2010 [August 8, 2011]. ^ Dylan's Secret Marriage Uncovered. BBC News. April 12, 2001 [September 7, 2008]. ^ Junod, Tom. Seven Questions for Bob Dylan. Esquire. 2014-01-23 [2015-04-21]. ^ Adams, Guy. How did Bob Dylan upset his neighbours? (The answer is blowin' in the wind). The Independent (London). 2009-03-18 [2010-07-14]. Bjorner, Olof. Olof's Files: A Bob Dylan Performance Guide (Bob Dylan all alone on a shelf). Hardinge Simpole. 2002. ISBN 1843820242. Bauldie, John (ed.). Wanted Man: In Search of Bob Dylan. Penguin Books. 1992. ISBN 0140153616. Beatles, The. The Beatles Anthology. Cassell & Co. 2000. ISBN 0304356050. Cohn, Nik. Awopbopaloobop Alopbamboom. Paladin. 1970. ISBN 0586080147. Cott, Jonathan (ed.). Dylan on Dylan: The Essential Interviews. Hodder & Stoughton. 2006. ISBN 0340923121. Dylan, Bob. Chronicles: Volume One（英语：Chronicles: Volume One）. Simon and Schuster. 2004. ISBN 0-7432-2815-4. Fishkoff, Sue. The Rebbe's Army: Inside the World of Chabad-Lubavitch. Schocken Books. 2003. ISBN 0805211381. Fong-Torres, Ben (ed.). The Rolling Stone Interviews, Vol. 2. Warner Paperback Library. 1973. Gill, Andy. Classic Bob Dylan: My Back Pages. Carlton. 1999. ISBN 1-85868-599-0. Gray, Michael. Song & Dance Man III: The Art of Bob Dylan. Continuum International. 2000. ISBN 0-8264-5150-0. Gray, Michael. The Bob Dylan Encyclopedia. Continuum International. 2006. ISBN 0-8264-6933-7. Harvey, Todd. The Formative Dylan: Transmission & Stylistic Influences, 1961–1963. The Scarecrow Press. 2001. ISBN 0-8108-4115-0. Hedin, Benjamin (ed.). Studio A: The Bob Dylan Reader. W.W.Norton & Co. 2004. ISBN 0-393-32742-6. Heylin, Clinton. Saved! : The Gospel Speeches of Bob Dylan. Hanuman Books. 1990. ISBN 0937815381. Heylin, Clinton. Bob Dylan: A Life In Stolen Moments. Book Sales. 1996. ISBN 0711956693. Heylin, Clinton. Bob Dylan: Behind the Shades Revisited. Perennial Currents. 2003. ISBN 0-06-052569-X. Heylin, Clinton. Revolution In The Air: The Songs of Bob Dylan, Volume One: 1957-73. Constable. 2009. ISBN 9781849010511. Lee, C. P. Like a Bullet of Light: The Films of Bob Dylan. Helter Skelter. 2000. ISBN 1900924064. Marcus, Greil. The Old, Weird America: The World of Bob Dylan's Basement Tapes（英语：Invisible Republic）. Picador. 2001. ISBN 0-312-42043-9. Marqusee, Mike. Wicked Messenger: Bob Dylan and the 1960s. Seven Stories Press. 2005. ISBN 1-58322-686-9. Marshall, Scott. Restless Pilgrim: The Spiritual Journey of Bob Dylan. Relevant Books. 2002. ISBN 0-9714576-2-X. Muir, Andrew. Razor's Edge: Bob Dylan & the Never Ending Tour. Helter Skelter. 2001. ISBN 1-900924-13-7. Ricks, Christopher. Dylan's Visions of Sin. Penguin/Viking. 2003. ISBN 0-670-80133-X. Scaduto, Anthony. Bob Dylan. Helter Skelter, 2001 reprint of 1972 original. ISBN 1-900924-23-4. Sounes, Howard. Down The Highway: The Life Of Bob Dylan. Grove Press. 2001. ISBN 0-8021-1686-8.